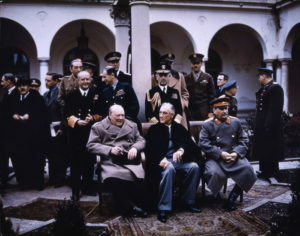 The conference took place at Yalta in the Crimea between 4 and 11 February 1945. The purpose was to lay out the groundwork for postwar Europe—Poland in particular. This entry was posted in World War II and tagged Churchill, Roosevelt, Stalin, Yalta conference. Bookmark the permalink.